Growing up, I went to church each week. I remember going to Children’s Church and singing songs (such as “Father Abraham” and “Jesus Loves Me”), and going to Sunday School and learning all about the stories in the Bible using felt board pieces. Back then, it only took a few pieces of felt to captivate a classroom full of kids! I loved hearing about the miracles that Jesus performed, especially the miracles of Jesus feeding the 5,000 (Matthew 14:13-21) and Jesus walking on water (Matthew 14:22 – 36). Those felt board pieces were so simplistic, but the stories behind them were powerful and stayed with me throughout the years. In the past, whenever I read Matthew 14:22-36 I always focused on the part about Jesus walking on the water. It wasn’t until I took a Motherless Daughters class that I began to focus on a different part of the story. During one class we focused on the fact that yes, Jesus walked on water, but Peter did too. In fact, Peter was the only disciple who got out of the boat, stepping into the stormy waves to follow Jesus’ calling. Peter was able to walk on water as long as he stayed focused on Jesus. As soon as he diverts his focus to the wind, he begins to sink and cries out for God to save him. Immediately, Jesus reaches out His hand and saves Peter. As soon as Peter and Jesus climbed back into the boat, the wind died down, and those who were with him immediately understood that Jesus was the son of God. Peter’s act of bravery (stepping out onto the water) led to a scary moment (sinking), but in the end it resulted in him being rescued and others’ faith being strengthened (because of seeing the interaction between Peter and Jesus). We each have our own “boat,” which is our current situation. If God is calling us to step into something new, we risk more by staying in the boat than getting out of the boat. By staying in the boat, we are comfortable, but it doesn’t allow us to stretch ourselves and explore everything God has for us. By staying in the boat, we not only risk missing out on the call God has for us, but we risk missing the opportunity for others to see how God shapes us and uses us through those experiences. Maybe we were meant to experience something that God wants to use to encourage someone else down the road. Maybe their faith will be strengthened when they see how God helped us through that same storm that they are now facing. 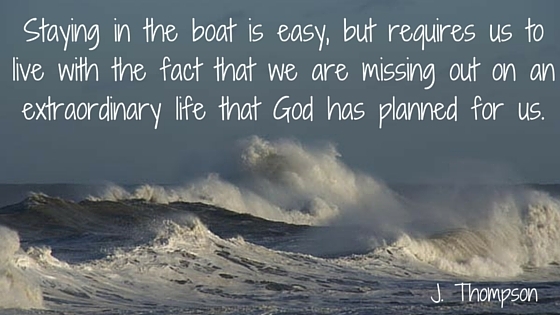 Staying in the boat is easy, but requires us to live with the fact that we are missing out on an extraordinary life that God has planned for us. Stepping out of the boat may initially seem like a risk, but when we step out knowing that we are following God’s voice, we will look ahead and see Him leading us. When fear takes over, all we have to do is call for our Father’s help, and He will be there to save us. Therefore, stepping out of the boat no longer seems as risky, since we have assurance that safety is provided in the loving arms of our Father. Over the past few years, stepping out of my boat has meant: moving to a new city, starting a new job, participating in The Journey class, stepping into multiple leadership roles, seeking support groups and counseling, blogging, and sharing my story with others (you can read part of my story by clicking here). I have experienced God’s love and blessings with each step, and that has encouraged me to step out of my boat the next time He calls. What does stepping out of your boat look like? If God is calling you to step into something new, step forward with confidence knowing that God will honor your obedience. Trust that He called you out of the boat for a reason and that what’s ahead is greater than anything you’re leaving behind.